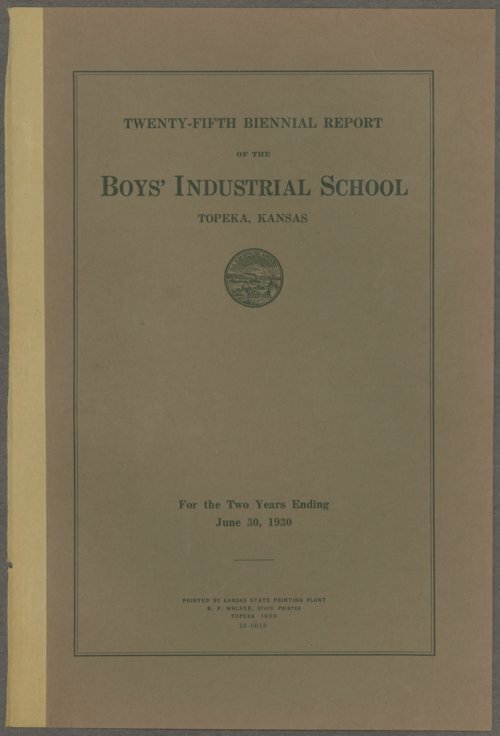 This is the twenty-fifth biennial report of the Boys' Industrial School in Topeka, Kansas. W. A. Smith was the superintendent. The Kansas State Reform School, also known as the Industrial School for Boys, was established in 1879 by a legislative act that appropriated $35,000 for the erection of buildings, etc., in Topeka, Kansas. Control and supervision of the school was placed in the hands of the Board of Trustees of Charitable Institutions. The school was located 3 miles north of the capitol building on an original tract of 170 acres that was given by the city of Topeka. The west wing of the main building was opened on June 1, 1881. The school taught boys the rudiments of useful employment as a means of supporting themselves after being discharged from the facility. The boys learned, among other things, tailoring, shoe and harness making, woodworking of various kinds, baking, and printing. Information included in this item are reports from the superintendent, medical agent, and parole agent. Also listed are general statistics on the school.